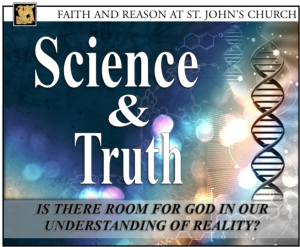 Is There Room for God in Our Understanding of Reality? View all five videos HERE. If you did not have the opportunity to attend these talks or missed one, we invite you to view these recorded talks by Jon Sprague. Jon explores whether science is capable of providing answers to the important questions we face in our lives, and whether there is even space for God and our understanding. During the course of five sessions, Jon reviews the current state of our knowledge of many of the most important aspects of science, including general relativity and quantum mechanics; the Big Bang and the future of our universe, and the beginning of life and its evolution on earth. In looking at these important areas of scientific achievement, Jon also considers the limits of science in explaining reality. Listen to the St. John’s Services on Podbean by clicking HERE. You can now listen to St. John’s Sunday lessons and sermon on your smartphone, any time you like, using the free Podbean App. Visit: www.podbean.com where you can create your unique LOGIN and PASSWORD. Using your personal device, visit either the App Store or Google play. Download and install the PODBEAN app for your devise. Launch the PODBEAN app and log-in. If you have not yet created your unique LOGIN and PASSWORD, you can do it now. Use the PODBEAN search function and search for “St. John’s Church Savannah”. As you might imagine, there are many St. John’s Churches around the world. You will recognize the correct one by the photo of our steeple facing Madison Square at dawn. Click to “follow” our podcasts and you will start receiving weekly content, automatically. You can review previous podcasts and each time a new one is uploaded, you will receive a notice.